Uranus is the seventh planet furthest away from the Sun and it is names after the Greek god of the sky Uranus. 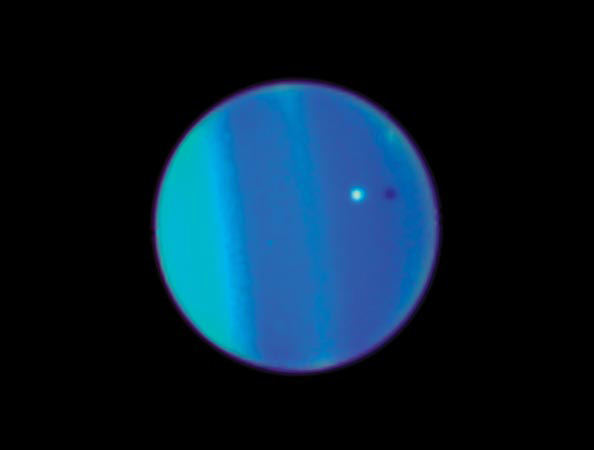 Uranus is one of the ice giant categories of planet and it can sometimes be viewed in the night sky by the naked eye. Uranus looks like a calm, cold planet by virtue of its light blue colouring – it is certainly cold (the coldest in the solar system), but it is not calm. The planet has had a very spectacular history. At some point in its history the planetary rotation of Uranus completely changed. Initially it will likely have rotated in a similar way to the rest of the planets in our solar system but an event occurred that made the rotation shift so that Uranus now spins on its side so rather than spinning in the same way that a spinning top would do, the planet rotates more like a ball rolling on its side. For more fascinating facts about Uranus, read on. The mass of Uranus is 14.5 times that of the Earth, its diameter is just 4.01 times larger than our Earth and Uranus is 2.9 billion kilometres from the Sun. Uranus orbits the Sun once every 84.04 Earth years and completes a full rotation every 17.2 hours. 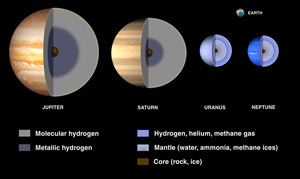 The basic composition of Uranus is similar to the other giant gas planets in our solar system with mostly hydrogen (about 80%) and helium (about 15%) present. The remainder is methane and a mixture of hydrocarbons. 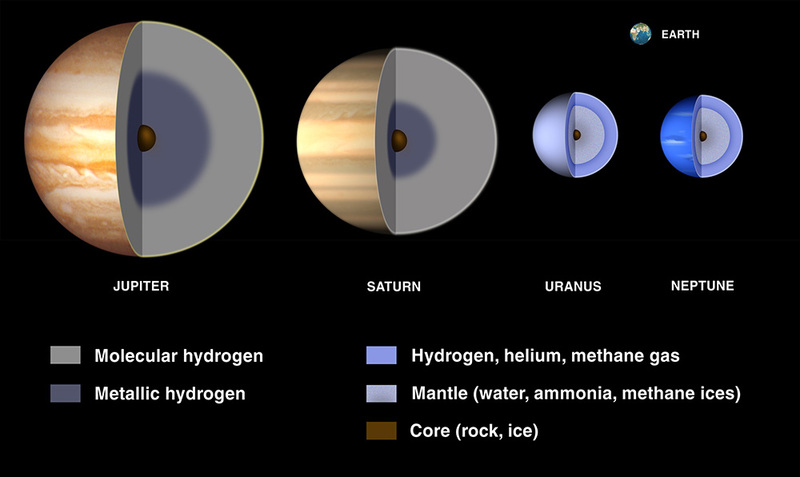 Inside Uranus and the other ‘Gas Giant’ planets. 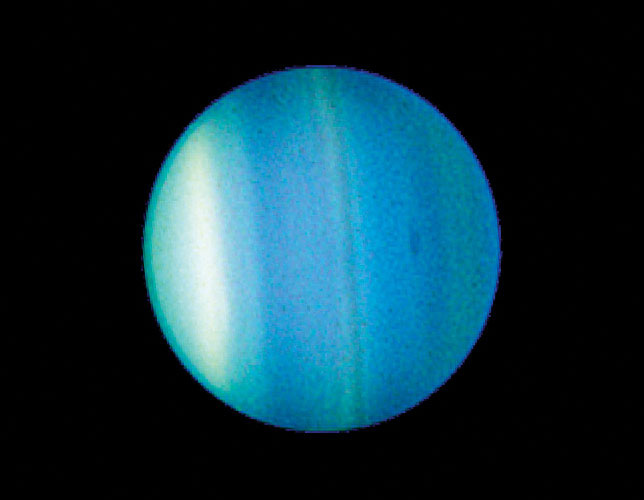 The bluey green colour of Uranus is caused due to the methane in the atmosphere. This absorbs red light so the reflected sunlight is greenish blue in colour. Uranus has a planetary ring system like Saturn but not as clear and much thinner. Currently it is understood that there are 13 rings in existence that are made up of small rocky particles. Unusually Uranus gives off less heat than it actually absorbs from the Sun. This is because something in the history of Uranus made the planets core cool down and this means that it doesn’t radiate much heat leading to Uranus taking the prize of the coldest planet in our solar system with temperatures as low as -224 °C. The wind speeds on Uranus can reach up to 824km/h. Uranus has an axial tilt of 97.77 degrees. In other words it rotates on its side rather than on its axis as is the case with the other planets. There are two main theories explaining why Uranus may have such a strange rotation. The first and most accepted theory is that during the formation of the solar system an Earth sized planet smashed into Uranus permanently knocking it off its axis. The other theory is that billions of years ago another planet pulled a large moon away from Uranus and the gravitational pull caused Uranus to be knocked off its axis. Uranus currently has 27 known moons. The five main moons are called Ariel, Miranda, Oberon, Titania and Umbriel. Uranus with Ariel, one of its moons. Uranus was the first planet to be discovered with a telescope. It was discovered by Sir William Herschel in 1781. Uranus rotates on its side rather than every other planet that rotates (roughly) on its axis.